The earliest recognised flight in Maryborough occurred late in the afternoon of 7th June, 1890 by Miss Gladdy Van Tassell who made a balloon ascent and parachute jump, landing near the Hospital in Walker Street. The first powered fixed wing aircraft landed in the grounds adjacent to Ululah Lagoon on Tuesday, August 3rd, 1920. It was a B.E. 2 Biplane flown by Capt. P.W. Snell. The planning for the present airfield here started in 1926, by the Town Council and an area north of the present grass runway was cleared on the existing racecourse, which had been in use for two decades. The first landing was in April 1927. Early pilots who used the field were WWI Australian Flying Corps Veterans Jack Treacy, Ron Adair and founder members of the aero club. Bert Hinkler landed at the original small showgrounds at the corner of Alice and Tooley streets on the 22nd June, 1928. 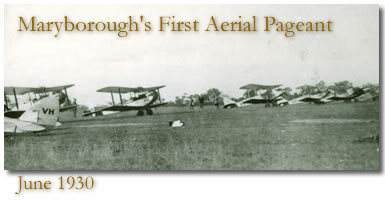 The first aerial pageant at the airport was held Saturday, 7th June, 1930 and organised by Charlie Hillman and K. McDonnell who stated that "an aero club in Maryborough seems now well within the bounds of possibility". The following years' pageant was held by the fledgling Wide Bay Burnett Aero Club on the 13th June, 1931, also a Saturday. During this month the club applied to be registered and this finally happened on the 5th February, 1932 (our birth date), later being incorporated in July of that same year. The clubs' first president was Skip Watson and the first instructor was N.A. Adam who also worked for 'Maryborough Airways and Flying School'. For the 1932 pageant, Sir Charles Kingsford Smith visited in the Southern Cross, arriving from Rockhampton at 4pm on the 22nd of July, and became patron of the Club. With him were his two brothers and Tommy Pethybridge. He flew joy flights all weekend and participated in the pageant on the Saturday. That evening he presented trophies, including one to Mr Stead Lowe, at the aero club ball in the Maryborough Memorial Hall. He also attended a civic reception at the Bungalow Theatre that evening attended by the Mayor, and spoke of his flying exploits. DH60 Moth VH-UJM of Mr G. C. Hillman was used by the Club until a syndicate of seven aviators purchased the first club plane VH-UFZ, an Avro Avian, (at least 3 of these flyers survived into the first decade of this century). This plane was used until 1936. After this, the Royal Queensland Aero Club sent aircraft from Brisbane for flying instruction, one instructor being Cyril Broome. Up until the war years the only club building was a shed owned by Mr Hillman, which housed the aircraft with the wings folded, next to the racecourse. During the war the aero club suspended operations as the aerodrome was extended to its present format but with some 190 Airforce buildings, the Clubhouse being one of them. Thousands of new recruits and wireless air gunners trained here until 1944 after which the British Royal Navy moved in for a while. The first post war meeting of the new Wide Bay Aero Club ('Burnett' having been dropped some time before the war), was held in May 1946 after being proposed by Mr Sam Hecker, with new officers and committee elected on the 6th September, Sam becoming President. The present club building was purchased for 200 pounds from the RAAF in November 1946, with funds raised by the wives of members by holding mannequin parades and cabarets. It had formerly been building number 160, a flight operations room, period photos showing it in its' current layout, including a front veranda awning. In the first year after the war there were 34 financial members and they flew 23hrs 5min dual instruction and 35hrs 35min solo. The first post war pageant was held in May 1947 with a number of RAAF aircraft attending. At this time Royal Queensland Aero Club Tiger Moths flew from Brisbane for instruction of members. During the late 50s and early 60s an instructor came down from Bundaberg using Tiger Moths, an Auster and a Tri-Pacer. The club has had various instructors in the last forty years and some aircraft have included our first wholly owned aircraft  Victa Airtourer VA-MBJ (February 1969), Piper Cherokee 140 VH-KLF (November 1970, Beechcraft Musketeer VH-B20 (leased December 1969). Some of these aircraft served concurrently. The Club membership surged in the early 70s with many pageants and cabarets. C172 VH-DDN was leased in 1975 and other aircraft have included C172s, VH-IEL, ITT, WLU and DMP and C150 VH-BUH. 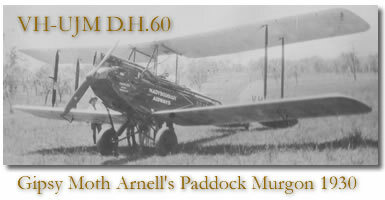 The club's name was changed in the 90s to the Maryborough Aero Club Incorporated.